This temple is famous for its Daruma collection. 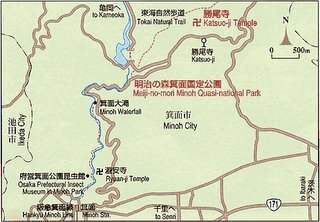 It is located close to the Mino Waterfall. Toward the end of the Nara Period, the temple was founded in 727. The main temple building, treasure house, etc. are standing in a row in the spacious precincts facing a hillside. 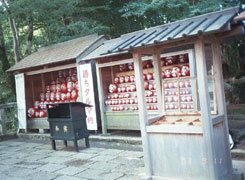 Besides, kachi (winning) - Daruma standing in the precincts are said to fulfill one's desire to "win" in business, examination, sickness, etc. and are popular as souvenirs. This temple and its Daruma helps you WIN : KATSU ! Win against the weakness within yourself ! Click on the thumbnails for more photos ! 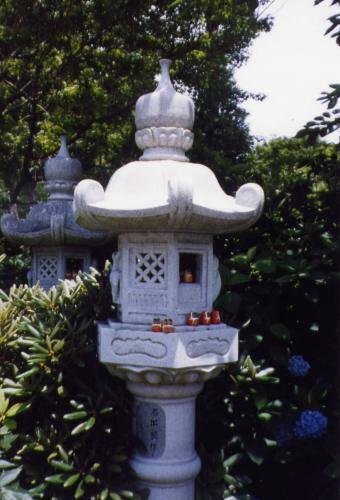 Notice the little daruma clustered round the bottom of the stone lantern - they were everywhere!!! 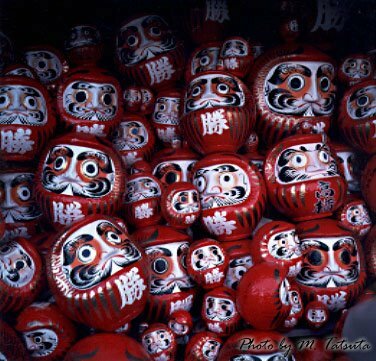 A whole colony of Daruma. Katsuoji is 'the temple of the winner's luck', so it's popular with students hoping for good exam results, as well as anyone else hoping to succeed with a difficult task. 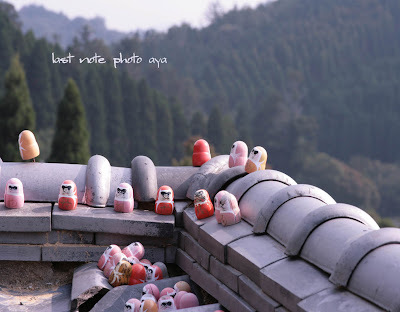 Hence the daruma taking over every horizontal surface in the temple grounds. 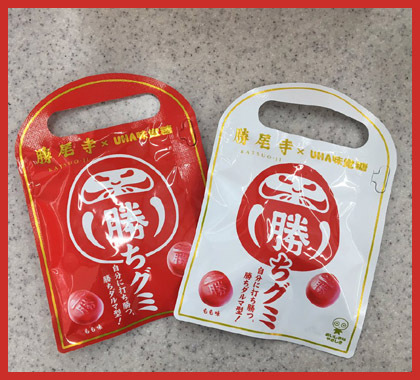 Daruma work very simply. Someone hoping for a piece of luck buys a daruma doll at the temple and takes it home, where they make their wish and paint in one of its eyes (they are sold with blank sockets). If the wish comes true, they bring the daruma back to the temple, paint in its other eye, and leave it as an offering. Will they blow away in a typhoon ? A page with many photos of Katsuo-Ji. Katsuo-Ji is Nr. 23 on the Saikoku Kannon Pilgrimage. Read Mark Schumacher about the Pilgrimage. They were twins, born in 708 in the Nara period. They were both priests. Their father was 藤原致房 Fujiwara no Munefusa. with the number 10 and 11.